If reading about the adulteration of milk and milk products in China has got your blood boiling (and just in time for Halloween! 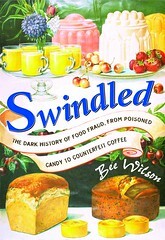 ), you’ll be doubly mad when you read Swindled: The Dark History of Food Fraud, From Poisoned Candy to Counterfeit Coffee, by Bee Wilson. The author of this timely book comes to the Princeton Public Library on October 15, as part of the Thinking Allowed series. In her book, Wilson uncovers the many ways swindlers have cheapened, falsified and even poisoned our food throughout history. In the case of the Chinese scandal, the recent furor is over melamine-laced food, but in the years preceding this development, Wilson writes, expensive formula made with outright fake milk, consisting primarily of sugar and starch, caused malnourishment and the death of many infants. The poor (literally) parents had scrimped on other necessities to afford the special formula, only to watch helplessly as their babies weakened and died. But this kind of thing has been a problem world wide, usually in fast developing nations with few regulations governing food production in place. In America, we learned the hard way too, and still are. Wilson describes the swill milk scandals of 19th century New York when dairy cows were fed swill from nearby distilleries resulting in near poisonous milk (“fortified” with chalk or starch). Read Upton Sinclair’s The Jungle about the Beef Trust, or consider the recent outbreaks of salmonella and e.coli, a symptom of overconfident industrial scale food production and distribution systems. Fortunately, Wilson has a sense of humor, so while you may groan, you’ll also get to chuckle over the sheer folly of some of these schemes and snake oil antics. How can you avoid being the victim of such culinary subterfuge? Unsurprisingly, Wilson advises readers to buy local and know your producer when possible, and the fewer processed foods you consume, the better. Hear, hear! Thank you profoundly for reminding us in new and evidently unforgettable ways to BUY LOCAL. I have had the privilege this summer of buying fresh vegetables at Cherry Grove CSA Farm(Community Supported Agriculture) on Carter Road just west of 206. The heft, beauty, savor and lasting qualities of their produce have simply astounded me. It IS true that the dew is still on the lettuce one gathers there. Even if, as for myself, one doesn’t have a share, one is welcome as a customer. And one’s ‘custom’ supports fresh wholesome local foods. Nothing is more urgent. As one who helped perpetrate fraud upon the American consumer, in new product development, then product photography (still and live t.v.) for General Foods, I know the thousand ways to fake televised food. I also experienced consistent test-kitchen choices of what I evaluated as “colored water and no mother in her right mind would buy it for her children” (Tang and Cool Pops) over the real foods of home-made bread, apple crisp and a beautiful red berry dessert of Scandinavia. I told the only woman Vice President, “You can keep me and do the opposite of what I write on every food evaluation, or let me go.” Her solution was to send me to Manhattan to the Television Kitchens. I have been “making amends” ever since. We really do need to stand up and demand the real and the healthy!